"qualified majority voting",QMV,"European Council","Council of Ministers","voting figures","voting systems"
From 1 November 2014 the European Constitution (aka Lisbon Treaty) imposes a new system, where EU Member States also vote according to their population. Then, eg, Ireland will vote with 4.4 million citizens and Germany with 82 millions. The system requires a “double majority” - as today where laws shall also have a majority of Member States voting in favour. From 2014 to adopt legislation or a policy will have to be supported by 55% of the Member States representing 65% of the population of the EU. To block a proposal at least four countries are needed while at least 15 countries must back up a decision for it to come into force. The inclusion of the population factor into this voting system mainly benefits the bigger countries while the "one country one vote" element benefits the smaller countries. The new system makes it much easier to take decisions. Currently qualified majority requires 74% of the weighted votes in the Council. The Lisbon system requires 72% of the Member States and 65% of the population for the few cases where a proposal does not need a Commission initiative. This has been called a super-qualified majority (SQMV). It is used when a new Commission is appointed and when the European Council elects its new permanent President. The latest QMV system means the three big countries—Germany, Britain and France can dominate decision making. As shown in the table below nearly 70 more areas have now been transferred to QMV by the EU Constitution. This means these areas have been taken away from national governments and parliaments. Voting arrangements in the European Parliament are on a simple majority and no QMV. MEPs sit in political groups which have to be more than 25 MEPs from at least five Member States. 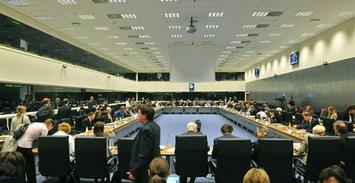 This institution votes on reports of legislation agreed at the European Council and Council of ministers level. These are handled by the Commission. In theory the European Parliament has joint powers with the Council but in practice this is not proving the case. A simple majority requires one vote more than half of the given votes. Decision by qualified majority voting (QMV) in the Council of Ministers currently requires 255 out of 345 votes. The votes of the Member States are weighted. In normal voting procedures in international organisations, every member has one vote each. In the EU Council of Ministers they normally vote with weighted votes where e.g. Ireland has 7 votes and Germany and Britain with 29 votes each. The Commission initiates legislation in the EU.